In an earlier post, Richard introduced our object detection demo and its underlying infrastructure. I’ll now offer details on how we built the Inception based neural-network at the core of the system and how we went about making it learn to detect pedestrians. It is a challenging detection problem: street scenes are very variable, with changing lighting, different clothing and different scales all posing potential problems. This is a great dataset to show off how well deep learning can work. Datasets are freely available: we used the 2D MOT 2015 Dataset and the Caltech Pedestrian Dataset. Pretrained deep learning image models are available, which are a great building block for an object detector. We used Google’s Inception v3 model. This article is a high level overview of the ideas and methods we used to train our detector. Google’s freely available Inception v3 model is a great object recognition model: given an image, it does an excellent job of telling what kind of object is in it. With a top-5 error rate of 3.5%, it is famously “better than human” on the ImageNet challenge, which contains over 1.2M images of 1000 different classes — Andrej Karpathy only scored 5.1%. The ILSVRC 2012 dataset which Inception v3 is trained on has 1000 classes, but “pedestrian”, or even “person”, is not one of them. Inception is a great image classifier, but it is not a detector: by default, it takes an image as input, and returns class probabilities, but it does not give any information about where in the image the object is located. How do we get around these issues? A fully-connected layer mapping this to 1001 output predictions: the class probabilities. It turns out that the 1x1x2048 representation of the original image produced by going through inception is very powerful. In a tutorial, Google show how to replace the fully-connected logit layer with custom labels to allow you to predict different classes from the ones in ImageNet. Even though only the very last fully-connected layer is retrained, the 1x1x2048 features do a good job on a variety of classes. 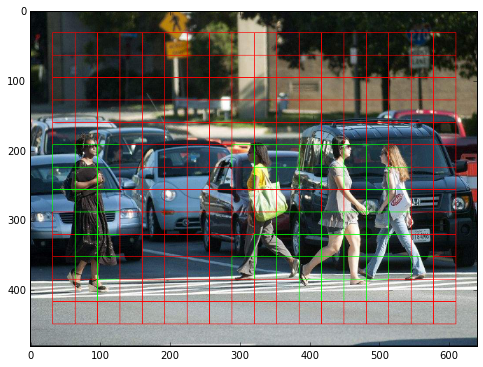 This addresses our first problem: by replacing the final layer, we could use inception to predict whether an image contains a pedestrian or not. But it does not help us to localise the pedestrians: we can only predict the image as a whole. We need a second idea. Solving problem 2: How to localise? One way to localise pedestrians in images could be to evaluate the classifier on different crops of the image. This approach works, but it is very slow: we would have to run the big Inception model from start to finish on each crop. The key insight towards using Inception to localise objects quickly lies in the final layers. As we saw, Inception actually produces an 8x8x2048 representation before using average pooling to bring this to 1x1x2048. We can interpret the 8x8x2048 representation as a grid of features, breaking the image down into 8 horizontal and 8 vertical grid squares. Then, instead of mapping one 2048-dimensional vector to the class labels, we can use a 1×1 convolution to map each one of these vectors to a class label, giving us a prediction at the cell level. The image below shows the resulting grid. The edges of the image are not covered: this is our attempt to take Inception’s lack of padding in its convolutional layers into account. The grid cells predicting pedestrians with a probability greater than 0.5 are drawn in green. You will notice the image is bigger than 299×299. This is a nice property of the Inception architecture: as it is fully convolutional, it can be fed with any size of input image. In our case, we used 640×480 as an input, which produces the 13x18x2048 feature grid shown. This is a major step forward: rather than predictions for the entire image only, we can get predictions at the grid level. We could have stopped here, but we wanted to go one step further: could we produce accurate bounding boxes for the predictions? For each cell, predict the four numbers (distance to top, distance to left, distance to right, distance to bottom). If there is no object under the current cell, ignore the output. Calculate the class predictions for each cell, as well as the bounding boxes. Keep the bounding box predictions for detections more probable than a threshold (e.g. 90%). This produces a bounding box prediction for each active cell. Lots of these will belong to the same object (see e.g. 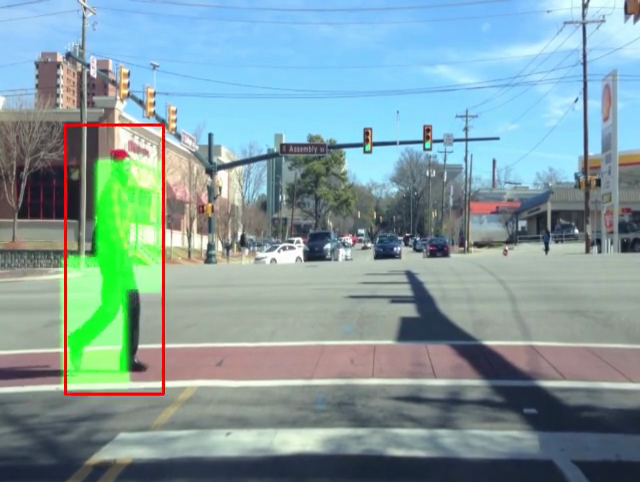 the grid image: each pedestrian lights up several grid cells, each one of which will predict a bounding box). Hence, as a last step, we group these boxes using non-maximum suppression. The algorithm which worked best for us was this one. The example below shows the bounding boxes before grouping on the left, and after grouping on the right. In addition, the pipeline we built to make this detector is completely general, which means that, in principle, any object of interest could be detected, not just pedestrians. Given the abundance and low cost of video cameras, we are excited about the potential of applying object detection to extracting meaningful information from video.